Falling oil prices – and the falling ruble – have different consequences for the budget and consumers. Oil prices – and the Russian ruble – continue to sink. As of Oct. 16, the price of a barrel of Brent crude, the standard on which the Russian budget is based, dropped below $83 on international markets. In the last three months, the price has fallen 24 percent, down from $108.77 a barrel in June. This is the biggest decrease since the 2008 crisis, when the price shrunk to a record $38.4 a barrel. Some estimates have shown the price falling even further, to possibly as low as $72 per barrel. Some Russian oil producers believe that if the price falls much further, the extraction of oil will stop because it will no longer be profitable. "We expected a reduction of oil extraction in Russia in 2016," said Leonid Fedun, vice president of Lukoil, in August. "But looking at our colleagues, we now think that it will happen even earlier, in 2015." Mikhail Krutikhin, a partner at RusEnergy Consulting, estimates that in the next 10 years, the volume of Russian oil extraction will be reduced by 15-20 percent. However, Krutikhin also thinks that the government can preserve profitability for producers if it lowers taxes on mineral extraction. At the moment, the oil producers are staying afloat partially thanks to the devaluation of the ruble. Since the beginning of the year, the value of the ruble has dropped by 20 percent against the dollar. According to Russian Finance Minister Anton Siluanov, "A one-dollar decline in oil prices results in a 70-billion-ruble reduction of revenue for the Russian budget. While a one-ruble fall in the exchange rate leads to a growth of 180-200 billion rubles." Sergei Khestanov, the director of the Alor Brokerage firm, explained how Russia is benefiting from a weak ruble. "The weakening of the ruble is beneficial for the budget, since its main revenue source (52-55 percent, depending on the estimate) is export. There is an increase in currency rescue, which improves exporters' profitability and balances the budget. "As a result we see a surplus - budget revenues outweigh expenditures," Khestanov said. However, although the government benefits from the ruble's devaluation, the population does not. According to experts, about 30-40 percent of the basket of consumer goods consists of imported goods – defined as those produced abroad and those produced in Russia using foreign equipment. "A 20-percent devaluation of the ruble [in relation to the dollar] increases the cost of food by 30 percent," said Khestanov. Furthermore, the lower the income level, the greater the spending on food. Therefore, such a fall in the value of the national currency is hitting the low-income population the hardest. What does the future hold for oil prices and the ruble? Alexander Baranov, Deputy Director of Pallada Asset Management and Sergei Khestanov of Alor Brokerage give both a positive and a negative predition. Baranov: "Oil prices will bounce back, as they did in 2012, and will return to the range of $95-120 a barrel.” In 2012, oil fell sharply from $130-100 a barrel to $100-90 and then returned to the range of $95-120. He also thinks the ruble will return to a 35-38 mark against the dollar. Khestanov: If sanctions against Russia are lifted, foreign debt payments will be reduced and turnover with countries that suspended relations with Russia will increase. This will result in a growth of 2-4 percent for the economy. Baranov: "Oil prices will fall another $10 and sink below $75 a barrel, which will result in the devaluation of the ruble.” In this case, the Russian budget will be short of 700 billion rubles. 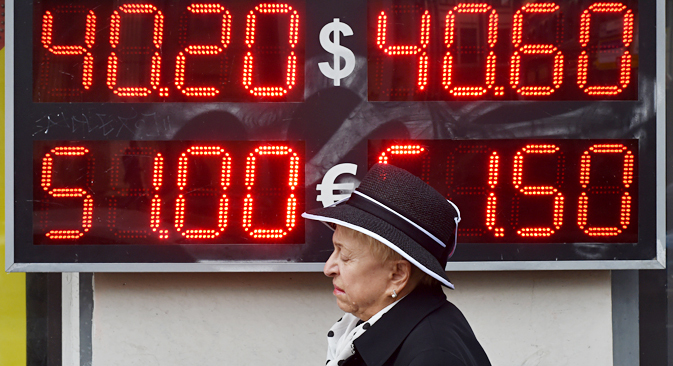 And to compensate, the ruble will need to be devaluated by another 8-9 percent. Another way to balance the budget will be to reduce budgetary expenditure. Khestanov: In the event that oil prices fall further, there will be enough budget resources for another year and the government will have to reduce the number of government personnel, cut pensions and, finally, print more money.